How do you move from one floor surface to another? Is your tile fireplace hearth flush with your carpet? 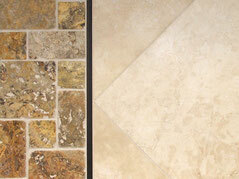 Is your entryway tile going to be taller than the hardwood hallway floors? The small space between your new tile floors and your other floors may seem insignificant, but it's a crucial consideration if you want your floors to look good and be safe. ...usually sits flush with a 3/4" wood floor, or a carpet with padding. However, some tiles are thicker and some are thinner. 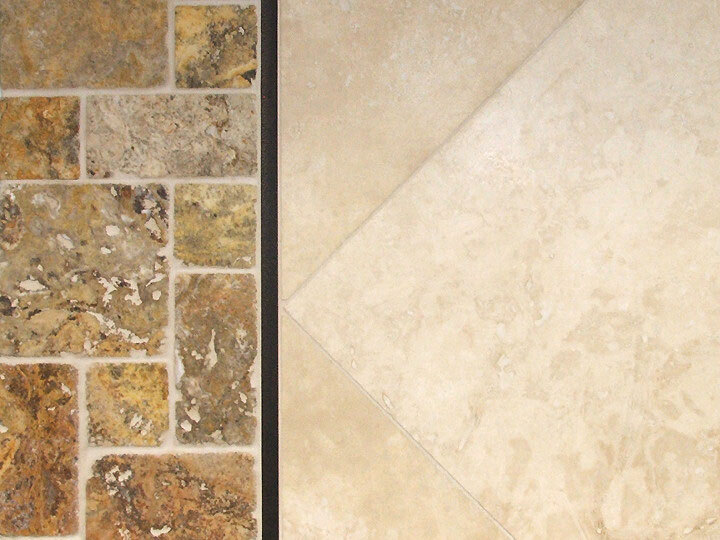 A large-format limestone tile can be up to 3/4" thick and require a thicker bed of mortar, while a small white ceramic hexagon mosaic can be as thin as 1/8" and is set with a very thin layer of thinset. If you plan to add in-floor heating, you might be adding some extra height. 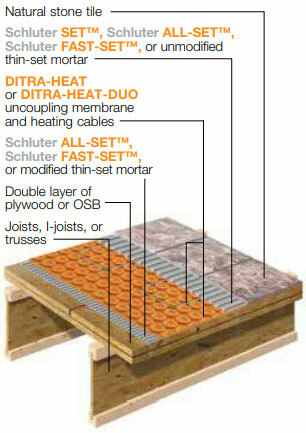 Schluter Ditra, at just 1/8" thick, is a thinner alternative to 1/4" backer board. If installing under-tile heating, we suggest the 1/4" thick Schluter DitraHeat, which replaces your backerboard layer instead of sitting atop it. You can also easily add more thinset for more height when working with thinner floor tiles. If two tiles are sitting side by side, and are different heights, add height to the smaller one with a layer of Ditra. 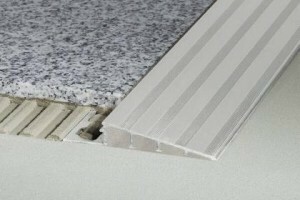 To avoid the trip hazard of an uneven floor, and to protect your tile's edges from chips and damage, you need a transition strip such as Schluter Profiles. Reno-T acts as a cap between mostly flush hard surfaces, such as tile and wood. 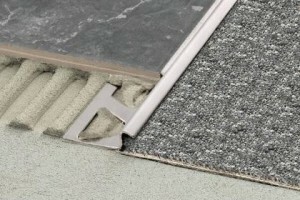 Whether your floors are flush or of differing heights, whether your tile is meeting wood or carpet, there are numerous Schluter profile options that can seam the transition between your floors. Schluter profiles serve multiple functions: by capping the edge of your tile they protect it from chipping or damage, they create a smooth transition between surfaces (especially those with different heights), and they provide a visual divider between flooring types. Tell us about your specific flooring situation so we can suggest the best option for you! Tile doesn't enjoy movement. 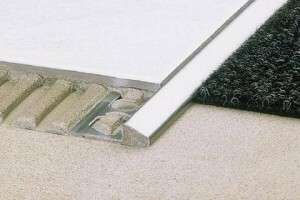 A plywood underlayment will contract and expand, potentially damaging your tile installation. A young concrete slab may shrink or crack, transferring movement to the tiles, causing breakage. There are several ways to reinforce your floor for added stability. 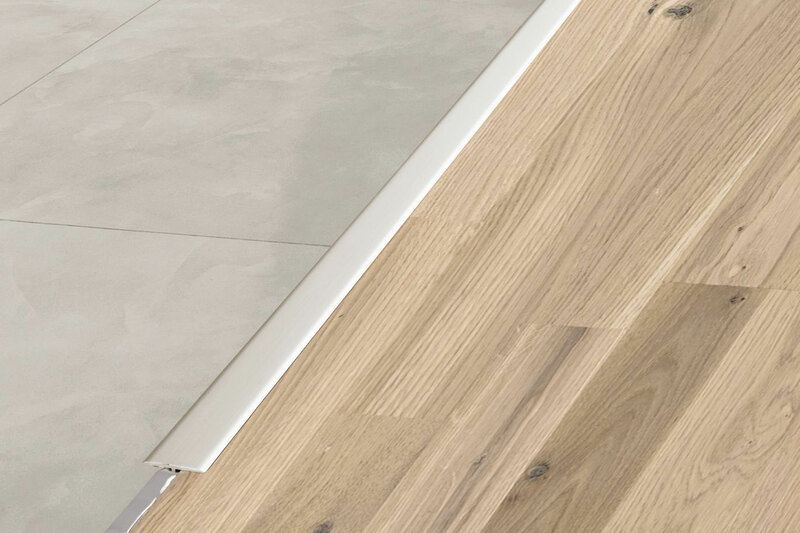 For most installations with a plywood subfloor, installing a concrete board such as Jet Backer or Wonderboard will stabilize your floor enough to support your tiles. Offset your joints, apply a thin layer of thinset between the boards for a strong, solid bond, and screw them down to the joists so that the boards are sandwiched tightly together, allowing the thinset to fill any air pockets. Sometimes you need to allow for more movement, such as on a concrete slab younger than 25 years. 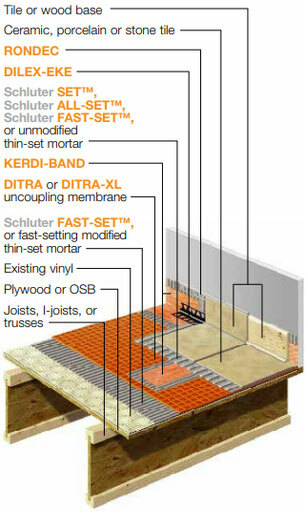 An uncoupling membrane, such as Schluter Ditra, will help to absorb movement and protect your installation. Ditra can also act as a waterproofer, perfect for basement floors, bathrooms, laundry rooms, entryways, tiled patios, or other areas where moisture may be an issue. If you're using unusually thick, heavy, large-format tiles, such as a 1/2" thick 24"x24" marble tiles, you may have to reinforce your floor. Natural stone tiles are, on average, about 1lb heavier per square foot than porcelain tiles of the same thickness, which are heavier than less-dense ceramic tiles. 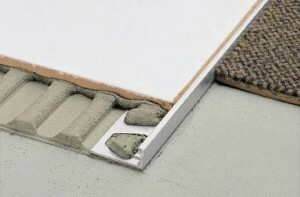 An extra layer of plywood (with the joints offset from the first layer) will strengthen and solidify your floor. Take care though: make sure your floor joists can support the extra weight of both the thicker underlayment and the tiles, along with whatever you're putting in the room (heavy furniture, a cast iron tub, etc.). You will also need more plywood if your floor joists are 24" on center instead of the usual 19" on center. Sometimes, you don't have the option of tearing out an old floor and replacing it with a new one. 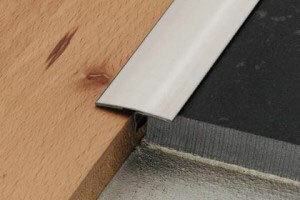 If your home was built in the 1960s, there may be asbestos under your old vinyl flooring. Or your linoleum might be glued down with the world's strongest adhesive. 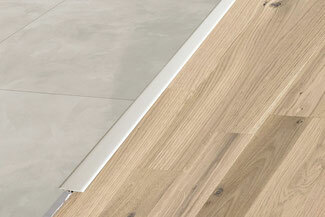 Whatever the reason, tiling on top of old flooring is possible, though it will add height to your floor. Check how the doors of the room are hung. If they swing into the room, you may have to shave some height off the bottom of the doors. 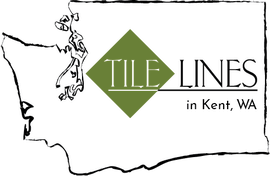 We don't recommend applying the tile directly to old floors. 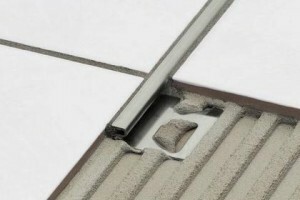 An antifracture membrane (Schluter Ditra) will provide the most flexible and supportive base for your tile with minimal height. Look for thinner tiles. Some tiles are available as thin as 1/8". Smaller tiles will require less thinset and, as a result, will add less height. Too many things to consider? We can help! Remodeling can be overwhelming. 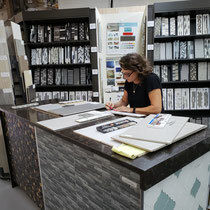 Fortunately, our staff can help you with design and tile selection, installation questions, and anything else you might need to complete your project.